S-26 GOLD® SOY is a soy-based specialty formula designed to provide complete nutrition for babies from birth who need to avoid dairy products. 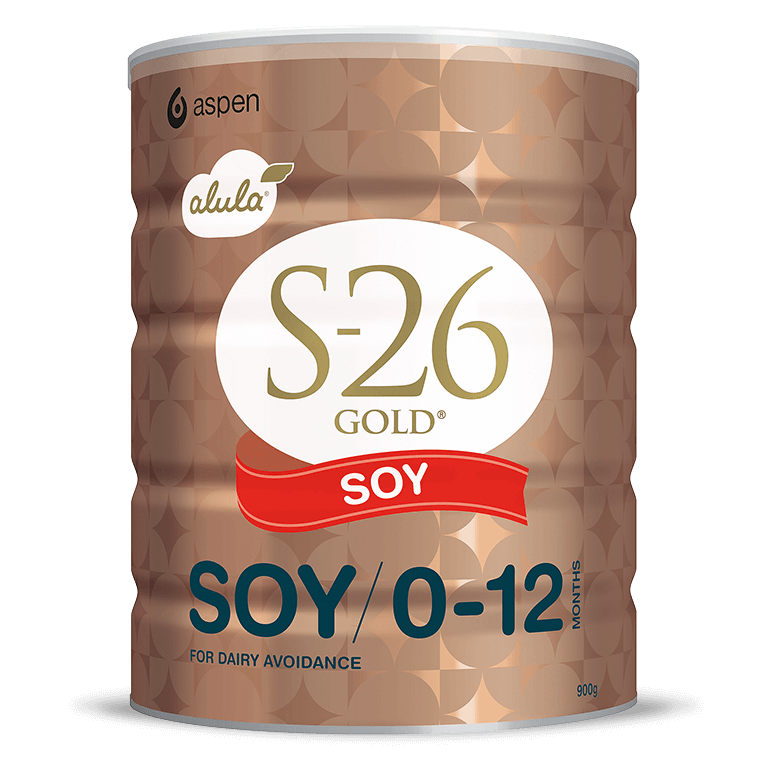 S-26 GOLD SOY is a premium, nutritionally complete, specialty infant formula for babies from birth who need to avoid dairy products, and for babies from 6 months with cow’s milk allergy. It can also support a non-dairy lifestyle that some parents may choose for their baby. It continues to support your baby through the time when solids are being introduced at around 6 months, as a well-balanced diet is important. As it is a specialty formula, consultation with a healthcare professional is recommended before use to ensure S-26 GOLD SOY is suitable for your baby. S-26 GOLD SOY is made in Mexico. Not suitable for general use and should be used under medical supervision. Corn syrup solids, vegetable oils (including soybean), soy protein isolate, emulsifier (soy lecithin), L-methionine, L-tyrosine, long-chain polyunsaturated fatty acids from single-cell sources (arachidonic acid [AA] and docosahexaenoic acid [DHA]), taurine, nucleotides (cytidine-5′- monophosphate, disodium uridine-5′-monophosphate, adenosine-5′- monophosphate, disodium inosine-5′-monophosphate, disodium guanosine-5′ monophosphate), L-carnitine, antioxidants (mixed tocopherols concentrate, ascorbyl palmitate), lutein. Minerals: Calcium, chloride, potassium, sodium, magnesium, iron, zinc, copper, iodine, selenium. Vitamins: Vitamin C, choline, inositol, vitamin E, niacin, pantothenic acid, vitamin A, vitamin B2, vitamin B1, beta-carotene, vitamin B6, vitamin D, folic acid, vitamin K, biotin, vitamin B12. The protein source of S-26 GOLD SOY Infant Formula is soy protein isolate.